After eleven weeks of raising our chicks without incident, we just lost a number of chickens to a night-time predator. At first, we were baffled. The modus operandi did not fit an owl or a weasel or a fox. It turns out, the culprit is a local dog. We think the dog scared the chickens into fleeing the safety of the poultry net fence. We found several killed outside the fence, and a neighbor reported seeing a dog trotting down the street with a chicken in its mouth. We have enlarged the protective ring around the shelter, and we plan to add roosting poles inside the shelter to encourage the chickens to stay there. It is a bit frustrating that our system has worked against wild predators, but failed against a domesticated pet. 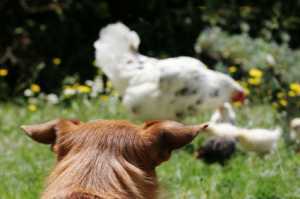 Maybe we will have to get our own dog and train it to guard the chickens.